Duffel bags are a great alternative to suitcases or backpacks and are designed to fit as much as you can comfortably carry. Whether you’re looking for something small to carry on the plane, or a massive beast of a bag with wheels to pull behind you, there are plenty of great duffel bags to choose from. A great duffel bag is one that has enough room for your clothing, enough extra pockets for your bits and pieces and one that you’ll be able to carry, wear, or pull along with ease. There are a number of qualities to consider before you buy your duffel bag. If you’re planning on being airborne with your duffel, it’s pretty important that it meets the carry on requirements of your airline. This way, you no longer have to worry about checking your bag into the hold, and you’ll always have your personal belongings within easy reach in the cabin. Small duffel bags will offer between 25 to 50 liters of usable space, and most of them will meet the 22 x 14 x 9 inch specification for most major U.S. airlines. These smaller duffel bags are pretty useful for weekends away, solo travelers, and those who only like to pack the bare minimum. If you think you need a little more space to carry your kit with you, consider a 50- to 75-liter capacity bag. Perfect for those who need more space for extra layers, but aren’t worried about carrying bulky equipment, most of these medium-sized duffel bags will need to be checked in when you fly. For those who do need to take the kitchen sink with them, large duffel bags with a 75-liter or higher capacity, are an excellent choice for adventurers who need to haul heavy loads as they go. From tents to fishing gear, and everything in between, you can fit everything into these oversized duffel bags, but watch your weight as bags over 50-pounds may incur excess baggage fees. Wheeled models will be heavier than non-wheeled duffels with some weighing as much as 20% of your total 50-pound luggage allowance — even before you’ve started to fill it. Heavy duffel bags are exhausting to carry long distances or up and down stairs, so think about how easy it will be to walk with your duffel when you need to. Wheeled duffel bags are much easier to lug around airports, and sling in and out of cars, boats, and trains. They usually have one main compartment that will hold your belongings with ease, making them the best-loved choice for those who need to take some serious sporting or camping equipment with them. Duffel bags without wheels are also a strong contender for those looking to explore distant shores as they tend to be lighter to carry. Wheeled or rolling duffel bags can become unstable on rugged ground, causing your belongings to fall or spill. If you’re carrying it close to your person, this won’t happen. The size of your duffel bag, how much it weighs, and how long you intend to be carrying it for, are all important considerations when it comes to choosing your new duffel bag. Wear it like a backpack or carry it like a tote, there are options out there, and you should choose the one that best suits you. Backpack style straps – If you like to throw your bag on your back and not need to access it regularly, many of the premium duffel bags on the market offer removable backpack straps that have some light padding to make them more comfortable then regular straps. Shoulder style straps – If you want easy access to your bag while you travel, and are only covering short distances, carry it using a shoulder strap. Lots of duffel bags come with shoulder straps that are removable. Whether you choose a wheeled duffel, or one without, at some point, you’ll need to rely on a handle to make simple maneuvers with your bag. Carry Handles – This could be a simple padded handle that connects the backpack straps, a pair of dedicated handles like a handbag, or just a single carry handle. Any of these are useful for picking up your luggage and moving it from one place to another, as you’ll often need to do when you’re hot-footing it around the globe. Grab Handles – Located at either end of the bag, or somewhere on the sides, these handles sit loose to the surface and can be used to “grab” you bag quickly or slide it along. These are very useful if you’re loading your duffel in an overhead bin, or putting it in a taxi. Duffel bags are designed for adventures, and with that in mind, you’ll no doubt want to make sure that you can carry everything with you when you go. Most duffel bags will offer plenty of useful internal storage pockets to keep smaller items safe in transit and make it easy to find them when you need to. External pockets are useful for items that you’ll need while you travel, such as your passport, your cell phone, or your noise-canceling headphones. Different brands of duffel bags will have different sizes and types of internal compartments. If you’re paying bigger bucks for your bag, you may even find that it comes with expandable external pockets that work well for keeping dirty clothing or footwear away from the rest of your luggage. Alternatively, they may have separate compartments inside the bag itself. While we’re on the subject, we should also talk about daisy chains, also called “lash points”. If you’re planning on traveling via plane, train, or automobile you might be wondering why on earth you would need to worry about such things, but stick your duffel on a roof rack, saddle it to a donkey, or take it just about anywhere else when you get there and you’ll see how vital they are. Bottom Line: If you’re planning on taking your bag with you on exotic adventures, you’ll want a duffel with plenty of reinforced lash points to keep your luggage safe and secure. Water resistant doesn’t always mean waterproof, and you’ll do well to remember this while you travel. Duffel bags that are advertised as “water resistant” are purely designed to keep your bag, and your belongings, protected from light rain and damp ground. If you throw your bag in the ocean, it won’t work miracles. Usually made from durable, ripstop fabric, water-resistant duffel bags are treated with a DWR solution that will help to prevent the moisture from soaking in. You should also be wary of zipper opening as these may be the weakest point on your duffel, and the place where the wet gets in if the weather is bad. If you’re keen on water sports, you may want to seek out a top of the range duffel that is made from fabric that offers better protection against actual torrents of water, but if you’re planning on sticking to dry land, water resistant should be good enough for you. If you want a duffel, you’re no longer tied to stuffy old canvas ones. Duffel bags are available in a wide range of materials including ripstop nylon, laminated nylon skins, and other water resistant and durable materials that should stay in good shape, wherever you take them. Made from a burly polyester ripstop material and covered with a highly weather-resistant TPU laminate and DWR finish, this is one heck of a duffel that will stand up to almost anything. A “black hole” of a bag, you’ll easily be able to fit everything you need in there and much more on your next big adventure. The main compartment has a large opening that makes for easy packing, while the zippered side pocket is perfect for super-fast access to essential items like your phone, wallet, or boarding pass. The 60-liter capacity is plenty big enough for a fun-filled weekend or a longer adventure, and when it’s empty, it simply folds into its own pocket for easy storage. 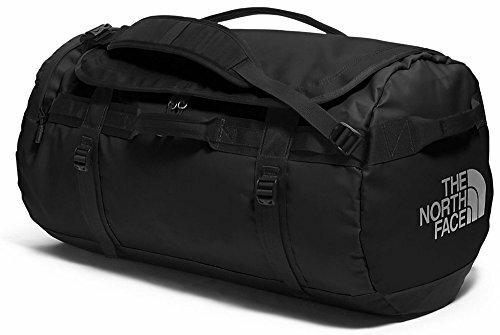 Lightweight and incredibly durable, the Black Hole Duffel has removable, padded shoulder straps that keep it comfortable while you walk with it, and the reinforced haul handles make it super easy to throw on the bus or grab at baggage claim. Internal compression straps ensure that your luggage stays in one place during transit. 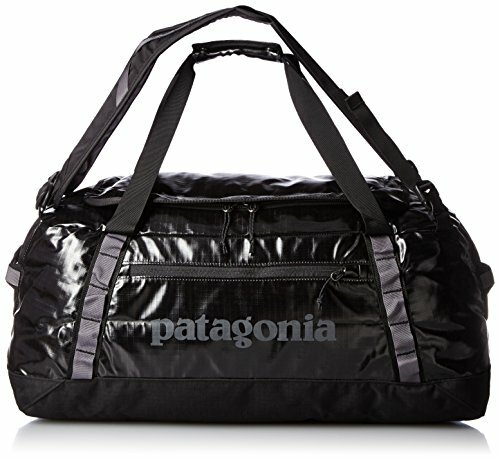 Bottom Line: A black hole worthy of exploring, this duffel is an all-weather vessel for every type of travel. 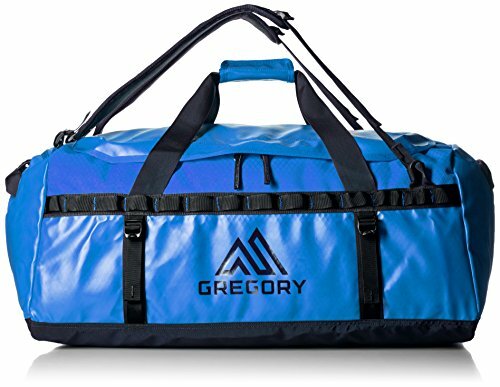 Rocking in at under $30, this is one of the most popular and capable duffel bags on the market today. Made from durable dragon nylon (a high-quality water-resistant fabric) this duffel will take you anywhere you want to go. You’ll have no trouble stashing all your gear in here as there’s plenty of space. The main compartment is great for all your usual clothing and kit, but there are hidden extras that will make you grin with delight. The shoe pouch, for example, is perfect for keeping smelly sneakers or wet flip flops away from the rest of your gear, while the large internal hanging pouch will keep your passport, travel documents, and anything else you hold dear, safe and sound on the go. For easy air travel, the bag comes complete with TSA friendly locks and easy opening YKK double zippers on the main compartment, meaning that both you and the airport staff can easily access your belongings! Bottom Line: With a water-resistant inner lining to keep any damp at bay, a board bottom to help keep the duffel bag upright, and a Velcro trolley strap, this is the perfect bag for long weekends, short excursions, or big days away. The Transporter from Osprey is available in four different sizes, 40L, 65L, 95L, and 130L. In this article, we’re concentrating on the 40L version. Compact on the outside, but incredibly roomy on the inside, this Tardis-like duffel bag doubles as a backpack with its yoked shoulder harness. Sling it over your back for long walks and adventures, then tuck that strap back in its very own storage pocket when you no longer need it. 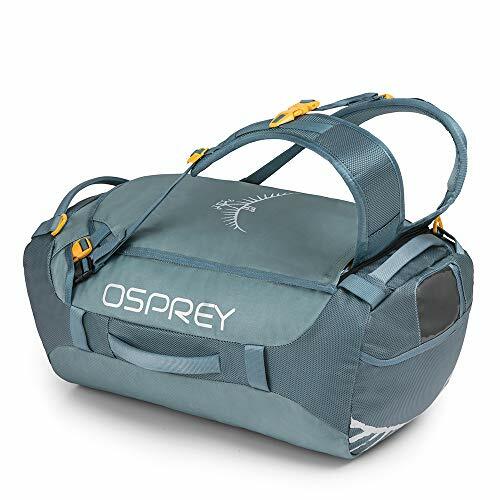 It’s clever additions like this that are synonymous with the Osprey brand and ones that many travelers love and actively look for. Made from tough 0.2mm TPU laminated 800D nylon, this beauty is weather-resistant and incredibly capable of withstanding the roughest of journeys. The zippers have easy-to-grab zip pulls for fast access on the go, and the main compartment has a smooth, lockable U-zip to keep your belongings safe. For those little extras that you need in transit, there are dual-zippered 3-D end pockets with overlapping rain flaps — perfect for stashing your phone, passport, or wallet. Bottom Line: Made by one of the best in the business, the Transporter is well worth its top price tag and is the kind of duffel bag that will last through many adventures. From the makers of possibly the very best coolers ever made, comes this super cool duffel bag that’s designed to protect your belongings from virtually anything. The Panga comes in 50, 75, and 100 liter versions, but in this article, we’ll be looking at the smallest of the bunch — the 50L. Claiming to be a “100% dry duffel” your gear should remain bone-dry no matter how wet the weather gets. Made with a unique Hydrolock zipper and a U-dock terminal to create an airtight seal, you should never have to worry about getting wet with this beauty — perfect for adventurers who love water sports. The thick skin shell is made from high-density, high-quality nylon, and thick TPU laminate, making it both puncture and abrasion resistant and perfectly able to withstand the bumps and knocks of international travel. The 50-liter volume means you have plenty of space to pack everything you need for your next adventure, and there are two side pockets that are great for easy access to everyday essentials like your cell phone, passport, or wallet. While designed to fit in an overhead airplane bin, we would stress that the rigid design of this duffel is both its saving grace and the biggest downside. You may struggle to squeeze it in if it’s fully loaded. 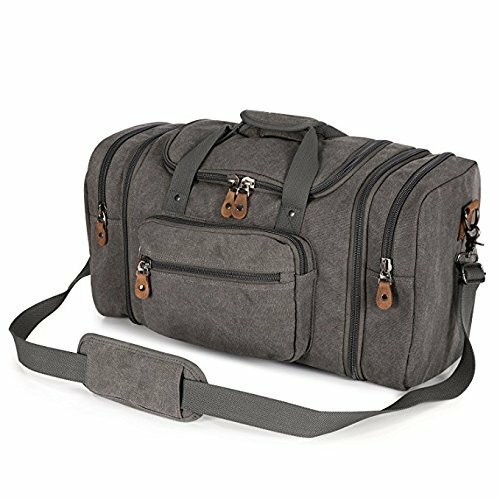 Bottom Line: If you’re happy to take the risk of a potential baggage check situation, this is indeed one of the most awesome duffel bags on the market today. Waterproof, resilient, and a great investment that should last you forever. This behemoth of a duffel, from big brand The North Face, is plenty big enough to fit everything you need on your next adventure, and then some! Available in a variety of sizes including 31, 50, 71, 95, 132, and 150L, we’re focusing on the massive 95-liter model. Made from highly durable 1000D phthalate-free TPE fabric laminate and 840D Jr. ballistic nylon, this bag should last you for many years to come. The main compartment is sizable and easy to secure using the D-zip opening with its weather-resistant zipper flap, while the internal mesh pocket will keep small things safe from sliding around during transit. Full of useful additions that you’d expect from a brand that knows its globetrotting audience, there’s an end-cap zippered compartment that allows you to separate wet clothes or dirty shoes. There’s also a zip mesh storage bag that acts as a packing cube. When it comes to carrying your life on your back, the detachable and adjustable, alpine-cut shoulder straps offer a perfect fit and allow you to carry your duffel backpack style. The four compression straps will keep it tightly packed and the water-resistant material should mean you’re good to go, no matter the weather. Bottom Line: Too big for overhead bins, this is one duffel that will have to be checked in. But, it’s size is great for anyone planning on long term travel. If you’re the high powered professional who needs to travel a lot with your work, this duffel bag could be just the ticket. That said, you could also use it for weekend breaks, family vacations, and a whole host of other adventures. Made from rugged 1800D Polyester with added fray-resistant seams and high-quality, jam-free zippers this is a bargain of a bag that will suit many applications. A heady blend of form and function, the Crospack travel duffel bag will keep your suit crease-free while looking every bit as stylish as you do. The unusual design of this duffel enables you to pack your clothes flat, using the fixed hanger and tie pockets, before rolling it up to become a compact bag that should fit in any overhead cabin locker. There’s also a handy compartment for keeping your phone, wallet, and passport safe, and a separate pouch for shoes and dirty clothing. The interior buckle system holds your clothes in place while your travel, helping to keep them in tip-top condition for when you arrive at your destination. Bottom Line: The one downside about this bargain bag is that it can be difficult to access the inner pockets while in transit, making them a bit redundant for holding any items that you need quick access to. Apart from that, this is a useful bag for anyone looking for a stylish duffel on a budget. Another big bag from one of the bigger brands in adventure travel, this ultralight duffel weighs a mere 1 pound 12 ounces but can hold a whopping 60 liters of gear. If that’s not the right size for you, the Cargo duffel also comes in 45, 90, and 120-liter versions. Made from water repellent Bi-Tech Armor Lite fabric, this duffel is designed for (nearly) all weather, and the bartack reinforcements on the stress points ensure it keeps its strength no matter how full you fill it. If you can’t decide how to carry your bag, this one gives you three different options. Either carry it using the removable backpack straps, padded top haul handles, or the side grab handle. There are also six incredibly useful lash points that can be used to secure the bag to a car’s roof rack, a camel, or any other unusual modes of transport. Made up of one large compartment and two easily accessible end pouches, the U-shaped lid is easy to open, and when you’re not using it, the smart back can compress into itself for easy carrying! Bottom Line: Perfect for camping trips, plane journeys, and even road trips, this is a little (big) bag that weighs next to nothing. Available in a choice of four sizes (S, M, L, and XL) it’s the medium bag we’re reviewing in this article. 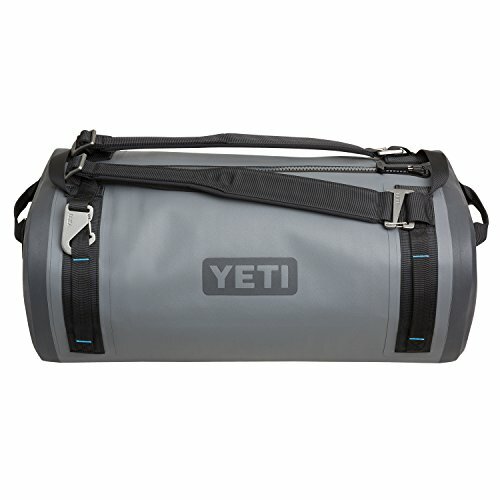 This duffel bag is made from 1000D 100% polyester with TPE laminate; making is super strong and able to withstand the bumps and knocks of domestic or international adventures. The lining is wipeable nylon which is great for internal leaks, while the bag is reinforced with 100% ballistic nylon for extra strength wherever you’re headed. 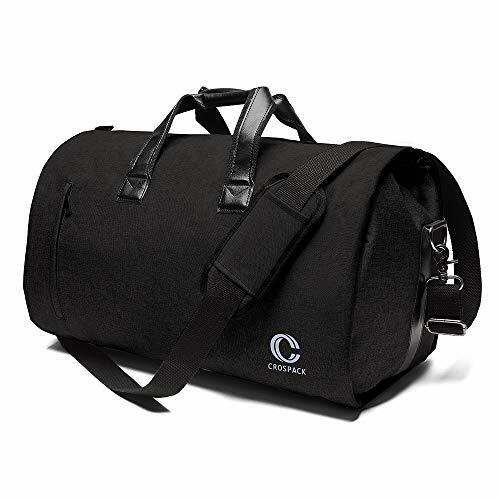 Ideal for an overnight bag, a checked bag, or even for the gym, this duffel has a D-Shaped main zipper opening for easy access and haul loops on both ends to make it easy to lift. The double bottom ensures its durability, and the tough YKK zippers will hold their own after many, many uses. The main compartment is plenty big enough to carry your clothes and belongings for big trips, and the zippered end pockets are easily accessible, making them perfect for stowing your passport, keys, cell phone, and wallet. There’s also a removable shoulder strap that converts to carrying handles giving you multiple carrying options when you need them. Bottom Line: This bag may not set the world of luggage alight, but it’s a nicely-priced, secure, and durable duffel bag made by a brand that’s synonymous with high-quality travel bags and accessories. 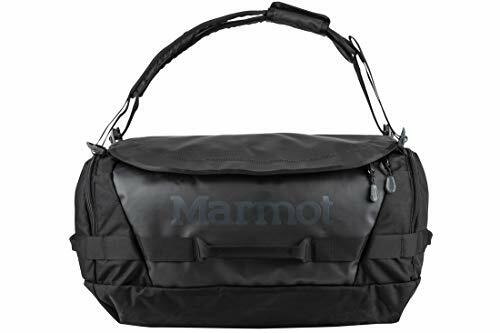 An investment well made, the Marmot medium duffel bag is a good size bag for most occasions. The Alpaca Duffel Bag is available in four different sizes (45, 60, 90, and 120 liters) but it’s the rather spacious 90-liter duffel we’re reviewing here. Made from 900D polyester diamond ripstop with TPU coating, and 630H HD nylon, this bag is designed to be strong! The TPU coating also gives it exceptional water and tear resistance, meaning it really should stand up to any amount of grief you throw at it. This is a large bag, and because of that, it could be heavy to carry for long periods of time. The manufacturers have thought of that and given the bag padded backpack straps that can be removed quickly when you don’t need them, using ladder-locks and girth hitches at the top and bottom. There’s also the option of haul handles with the hook-and-loop wrap for comfy carrying and a daisy cabin should you wish to secure your duffel to a roof rack or a long distance yak. The lockable zippers are U-shaped, and the entire top panels open fully for easy packing — handy when you’re planning on taking a lot of gear with you. There’s also a zippered end pocket, that has a useful feature which allows you to display your ID from within the bag itself. (No lost luggage tags for you!) Simply stick your tag or business card into the water-resistant, semi-transparent mesh window, and you’re good to go. Bottom Line: A big, durable bag that has a large main compartment, the 90L Alpaca is great for longer-term travelers. The Thule Chasm Duffel bag comes in a choice of four different sizes (40, 70, 90 and 130 liters), but in this article, we’re looking at the sizable yet easy to carry 70-liter option. Made from Phthalate-free TPE laminate with a 1000D nylon base, this duffel is durable, water resistant, and offers exceptional tear resistance. The bag also comes in an array of attractive colors. The Bluegrass option is perfect for sticking out in a crowd. 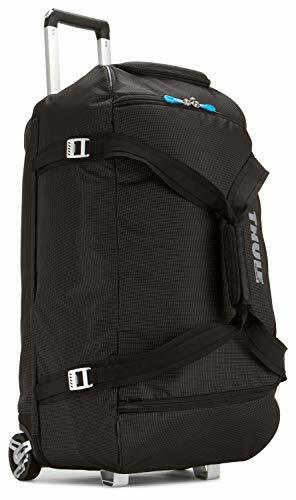 Because carrying your luggage is important, Thule has included removable backpack straps that make lugging your bag over long distances as easy as pie. When you get there, remove the backpack straps, and revert to using the duffel strap as usual. The oversized, wide mouth opening is perfect for easy access to your belongings, and the external compression straps are designed to prevent your belongings from getting squashed up at the bottom when you carry it in backpack mode. On the inside, there are also internal mesh pockets for keeping smaller items safe and a lockable, zippered side pocket for keeping small items secure and within reach while you travel. Bottom Line: A nice bag, brought to you by the people who do skiing and roof racks well. 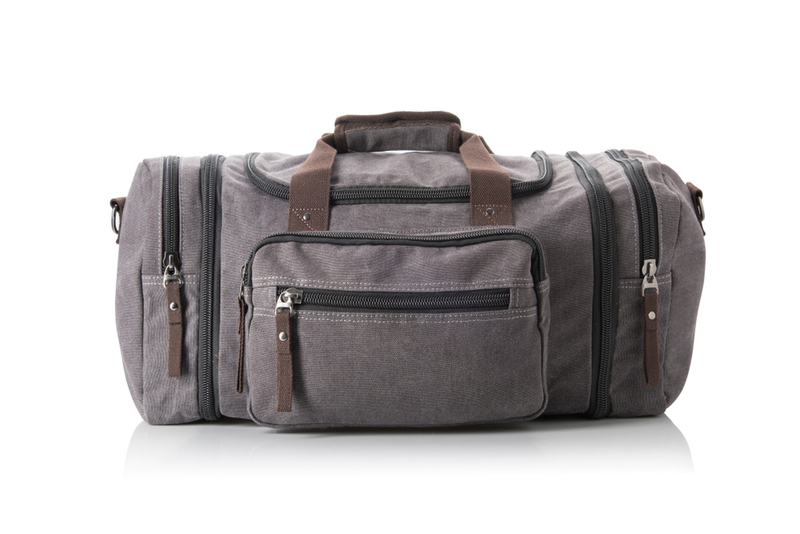 This is a stylish and almost retro looking duffel bag that’s well suited to the traveler about town. Made from high-density 16 ounce, 100% cotton canvas, and featuring classical bronze-tone hardware, this bag is as stylish as it is practical. With a 50 liter capacity, the large main compartment can easily hold your clothes, shoes, and toiletries as well as a 15-inch laptop or large iPad. The inner zipper pocket is perfect for smaller items, and the two side and front pockets, as well as one on the back, means you have plenty of space for everything you need speedy access to. If you need even more space, there are two zippers on each side of this little duffel that will expand the capacity of the bag, and give you more room to carry your gear. The bottom of the bag is well cushioned and has a hard film protector to help keep your belongings dry and safe on dirty or damp floors. Bottom Line: Compact and easy to carry, this is a great overnight or weekend bag, that has nicely padded handles and an adjustable and removable shoulder strap. Probably not ideal for around the world adventures, this is a capable duffel designed with style and practicality in mind. 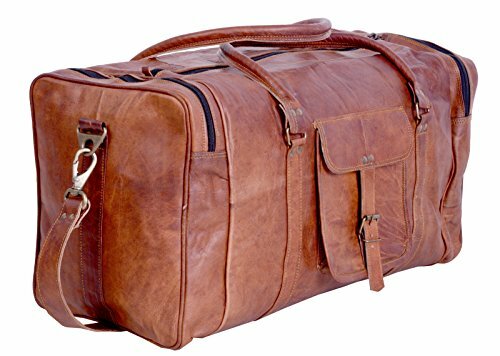 This vintage-style leather duffel bag is a real classic. Made from genuine, full grain leather, the rich natural patina of this bag will change over time, ensuring that it always stands out from the crowd. This beautiful bag will be just as home in a first class cabin as it would be out in the wild. Carrying a bag like this makes a real statement. With one large compartment that will hold your clothes, shoes, and toiletries, you can keep the remaining two side zipper pockets free for items you need instant access to, such as your passport, cell phone, or wallet. The interior is also fully lined with canvas giving more practicality, and a high end feel. The front, satchel-style pocket adds interest and is in keeping with the vintage look of the bag, while the adjustable carry strap is well padded and can be removed when not in use. Want to carry it instead? This bag also comes with two sturdy, leather handles that will feel awesome in your hands as you carry your gear from plane to hotel and back again. Bottom Line: A super stylish bag, for a very reasonable price, even if it’s not as large or practical as some of the others on our list, it looks the part. Really, “no matter what” your adventures throw at it, this bag can handle almost everything! 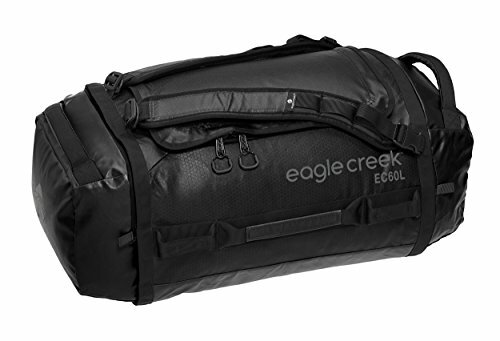 With a capacity of 128 liters, this duffel is big enough to cope with all of your gear while you travel. Made from tough Bi-Tech fabric, it offers abrasion resistance and weatherproof capabilities, while the super tough webbing and seam reinforcements mean your bag won’t fall apart when you fill it up. If you find it too big to carry comfortably for more than a moment, you’ll be delighted to hear that this beauty comes with oversized, heavy-duty, treaded wheels for smooth mobility and maximum durability. You’ll be able to easily maneuver it through airports, hotels, and business centers, while it will still be able to handle rough terrain like a boss. If you need to carry it for longer distances, the adjustable and removable shoulder straps allow you to use it as a backpack. Or, you can use the center haul handle for rolling long distances and the side grab handles when loading it onto transportation. The main compartment is easily accessible and plenty big enough to carry your clothing and equipment, while the front zipper pocket is ideal for stowing fast access items like your headphones, cell phone, and book. Bottom Line: A big bag, for even bigger adventures, the No Matter What rolling duffel is an excellent choice. 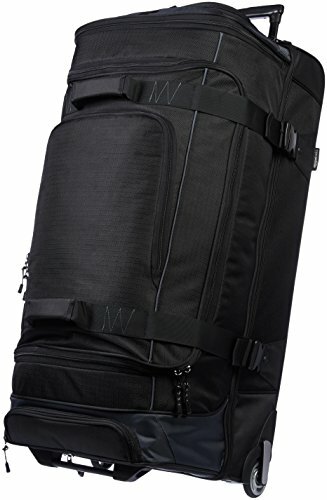 Another great bit of kit form the AmazonBasics range; this ripstop wheeled duffel comes in 26-inch, 30-inch, and 35-inch variations. They’re also available in multiple colors, such as black, blue, or red. Here we’ll look at the larger 35-inch version. Its durable design makes this an affordable, yet practical option for anyone heading off on a vacation or adventure. With 100% polyester top to protect against the moisture in the air, and sides and base made from 1680D ripstop nylon and 210D lining, this bag is strong and well made for the price. Because AmazonBasics understand that you want to take as much away with you as you possibly can, they have incorporated multiple zippered front and main compartments for easy organizing and secure storage on the go. The top portion is deep, and the opening is wide, making it easy to pack while the end pockets are perfect for stowing your passport, cell phone, wallet, and keys, or anything else you need easy access to. When it comes to moving your gear around, the upright, telescopic handle and in-line wheels ensure easy mobility over smoother terrain and will cope (just about) with more rough roads on location. Bottom Line: Perhaps not as good as some of the more expensive rolled duffel bags, this is a good bet for the budget conscious traveler. 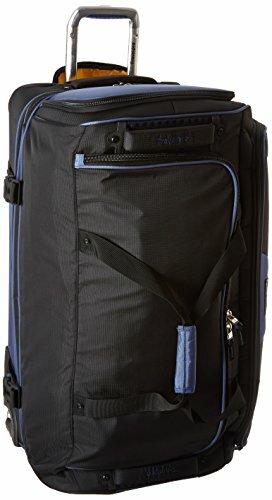 The largest rolling duffel bag in the Travelpro range, this drop bottom bag is big enough to carry tons of stuff and easy enough to roll around the globe. 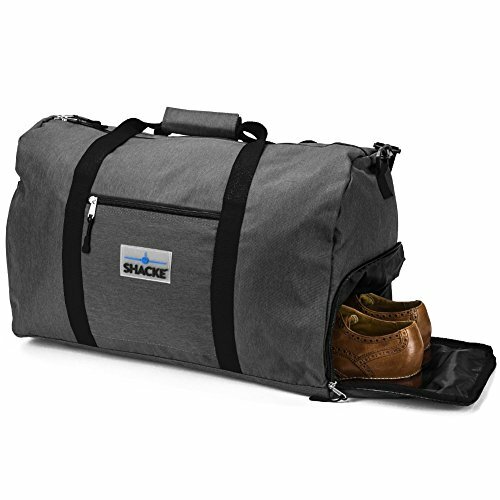 Made from rugged, high density 100% polyester fabric, this duffel has a water-resistant coating to keep your belongings safe and dry wherever you may be. This duffel also comes with a Built For A Lifetime Limited Warranty. Inside, the zippered divider panel allows for two separate packing spaces or one large packing compartment, depending on your needs, and the adjustable, hold-down straps will keep everything in place while you’re on the move. Need more space? No problem. This duffel comes with 2-inch expansion capability for additional packing capacity and a large zippered wet pocket for damp or dirty items. The high-performance ball-bearing wheels are built for high-mileage travel, and the silky smooth ball-bearing inline skate wheels make this duffel a pleasure to pull along with you. Bottom Line: The Aircraft-grade aluminum handle system makes it incredibly comfortable to find the right height for your needs, and the compression straps will keep the duffel neatly pulled together. 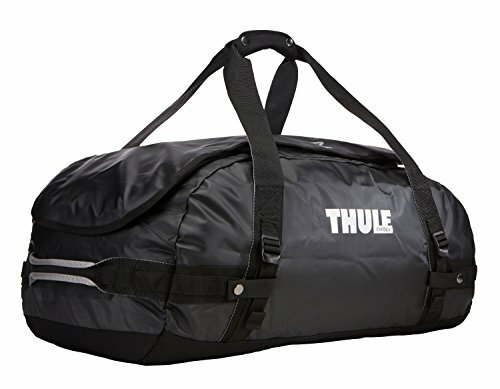 This top of the range Thule duffel bag is an all-singing, all-dancing kind of bag that will accommodate everything you need and more on your next adventure. With an 87 liter capacity and a wide unobstructed mouth for easy loading, this is one of the best, wheeled duffel bags your money can buy! The durable exoskeleton and the molded polypropylene back panel are designed to withstand rough terrain and absorb the impact of rugged travel. The durable, oversized wheels make for smooth rolling, and the patented Thule V-Tubing telescoping handles guarantee a steady and straight pull that’s a pleasure to roll along behind you. The main compartment is as big as they come and can comfortably house all of your clothing and travel gear, while the divider allows you to keep your dirty gear separate from your clean stuff. The heat-molded, crush-proof SafeZone is a revelation that allows you to protect your eyewear, portable electronics, and other fragile gear on the go. This is a handy feature for anyone who wants to take expensive bits of kit with them while they travel. This compartment can also be locked and removed to keep your stuff safe. Bottom Line: A very impressive duffel bag, with a price tag to match, this is an investment item for those who want to up their duffel bag game. For every journey, there’s the perfect duffel. While wheels or no wheels will always be a great debate, whatever camp you’re in you’ll find something to suit your travel needs. 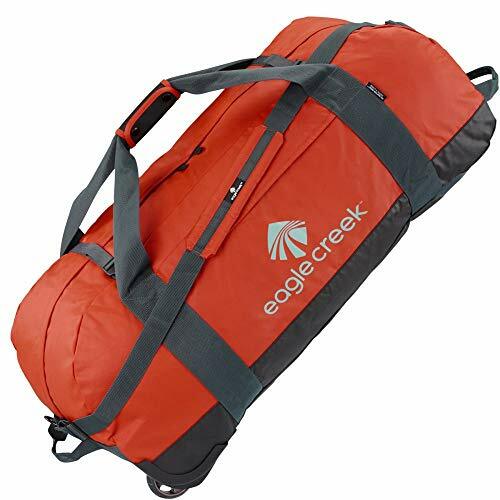 With so many great duffel bag manufacturers out there such as The North Face, Patagonia, Marmot, Osprey, and Eagle Creek, you’re spoiled for choice!